Woof, well really more than two months. 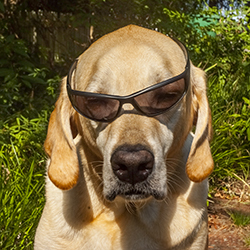 I have been having a great time working as a service dog. We have been going on a lot of hikes everywhere we have been going. Sometimes it is hard to remember I am working so many people are kind and well meaning and they want to pet me. Sometimes Matt lets them if we are resting. This year has been more fun than last year. I hardly ever have to wait in the truck anymore. We were recently in Zion and Bryce national parks, at first I thought Matt said it was Rice Canyon. Can you imagine a canyon full of rice? Matt had a good laugh with that one. We had a nice weekend not too long ago with Matt’s cousin and his family camping out. Woof, of course when are we not camping out right now? I spent the whole time off leash and not working, I got to roam and play all I wanted to until I just had to lie down to take a nap. We were not near a road and the best thing is there was a creek there, I got to play in it all I wanted and it was fun. I had kids to play with and they wore me out. We stayed there for two days and I got to eat real meat, Tim gave me so much and it was good, ruff! We spent almost the whole time in camp enjoying each other’s company. When we got ready to leave Theresa gave me a new toy and I love it. After that we went back to the big lake called Powell and this time Matt let me go swimming. Then we went to see a big river called the Colorado. The river was big and the water was flowing too fast Matt said. The net place we went was Zion where we did a lot of hiking. Woof we have been to so many places it is hard to remember them all right now. Then we went to Bryce the rice canyon. I still like to think of it by that name. 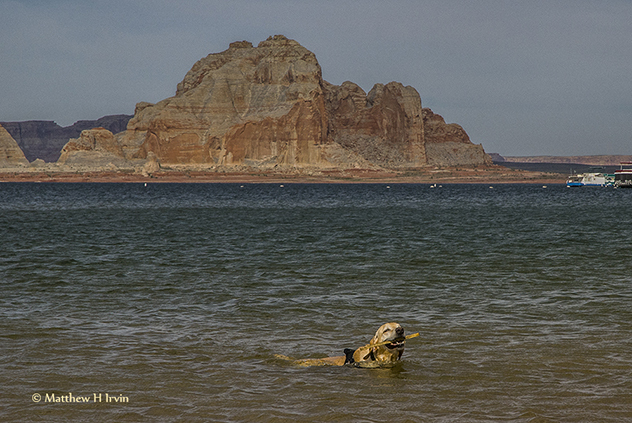 Me swimming at Lake Powell! We camped in Bryce Canyon park for several days. I think Matt was tired when we arrived. He just about pulled into the first place he saw. After trying to find camping places at pother crowded parks he said we were going to stay for a while to have fun plus get some rest. 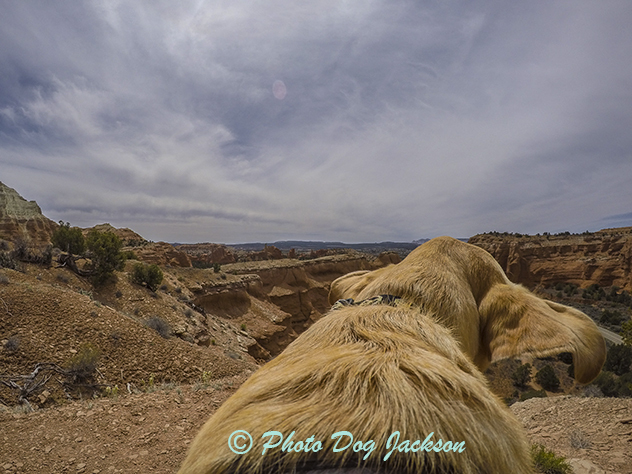 So far we have hiked down into Rice Canyon (woof, just making a funny) and then hiked at another canyon close by called Red Canyon. The next day we hiked at Kodak Park, at least I thought it was called that, Matt told me it really was Kodachrome Basin State Park. It was windy at Kodachrome park!. The next places we went were Arches and Canyonlands parks then we went to Capitol Reef, I got excited because I thought we would see the ocean. Matt told me it was not that kind of reef. It was a beautiful place, we hiked on several trails and it even started snowing when we were on a trail so we had to go back to camp. We are stayed more than one night in a motel in Grand Junction when the weather got bad, I learned about motels last year. There were a lot of dogs and humans there, woof and they are nice and warm. We are heading out this morning to start camping again and more adventures. Previous PostWoof, it Snowed Again, and AgainNext PostYellow Stones and More Snow! 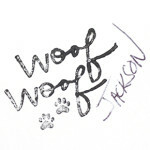 Woof, woof Jackson. You are really getting to be the best therapy and working dog. We all love seeing and hearing about your adventures with Matt and all your old and new friends. Snow now is something unusual for most of us too, Jackson. Here it is chilly, but flowers are popping out their pretty heads and the trees are becoming leafy too. Spring has sprung! Is is one of your special favorite times of the year? 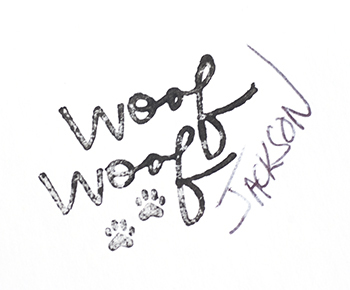 See you soon, woof,woof. Hey there would you mind sharing which blog platform you’re working with? I’m planning to start my own blog in the near future but I’m having a tough time making a decision between BlogEngine/Wordpress/B2evolution and Drupal. The reason I ask is because your design and style seems different then most blogs and I’m looking for something completely unique. P.S Sorry for being off-topic but I had to ask! I use WordPress it seems pretty to use.